In 1977, a group of sports fans created a trophy to commemorate the newly renewed Iowa/Iowa State Rivalry. 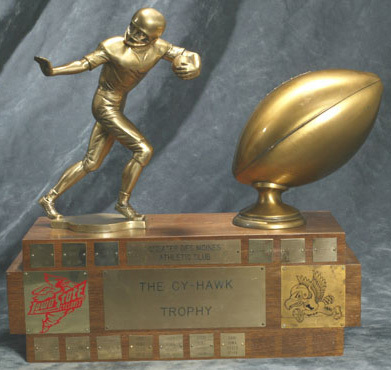 Over the next 30+ years, the Cy-Hawk Trophy became the symbol of the game and a piece of Iowa’s history. In the fall of 1977, Iowa and Iowa State were poised to meet on the football field for the first time in 43 years. For decades, fans begged the schools to renew the rivalry. The state legislature even passed resolutions demanding the game be played. Officials from both schools negotiated terms several times, before backing out at the last moment. When a deal was finally struck, it was for only a six- year series Many – including some athletic department officials – expected the game to be a short-lived novelty, not to be renewed. A group of football fans from Des Moines wanted to do something about that. They came from all walks of life, graduates of both Iowa nad Iowa State. They were bowling buddies. Taking inspiration from the group that bestows the Heisman Trophy, they dubbed themselves The Greater Des Moines Athletic Club. They created a trophy as a way to commemorate the game, to make it something fans of each school could point to and take pride in. Group members paid to have the trophy designed and built out-of-pocket, with no corporate sponsorship. 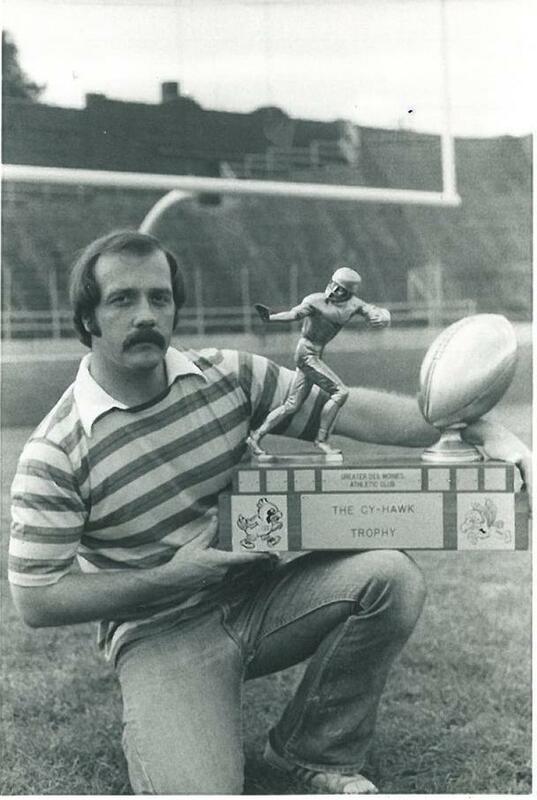 When they saw the original design, with engraved images of Cy and Herky glowering at each other from across the trophy, the name was clear: Cy-Hawk. The 1977 game was even bigger than anticipated. Iowa State University students filled Hilton Coliseum for a lottery for tickets to the game in Iowa City. 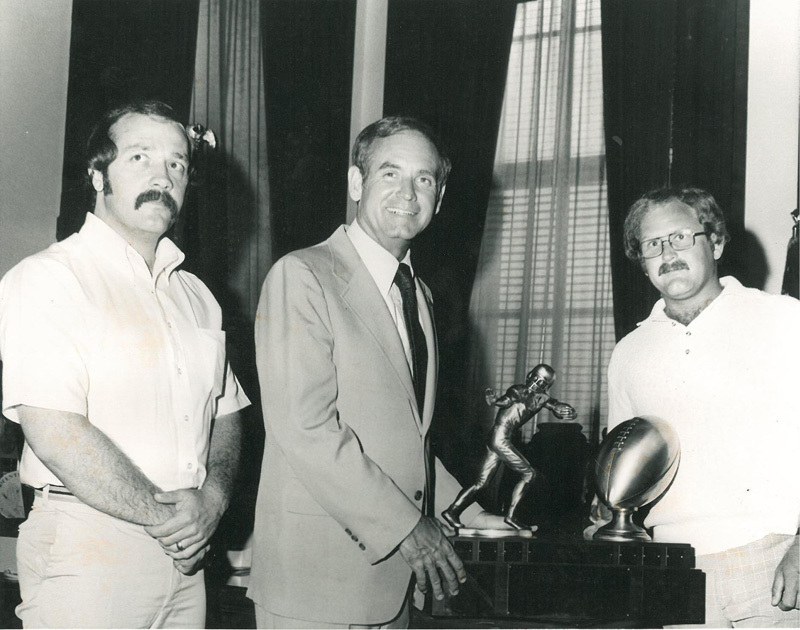 Iowa Governor Bob Ray presented the trophy to the victorious Iowa Hawkeyes, and the first plaque was etched into the body. Fans enthusiasm for the game never waned, and the series continues to be renewed. Before long, the game itself came to be know as the “Battle for the Cy-Hawk.” Perhaps no image of the rivalry is as iconic as the winning team hoisting the trophy high into the air. 35 years later, a reinvigorated Greater Des Moines Athletic Club is working to preserve the original Cy-Hawk trophy as an important part of Iowa history. The original mission also still remains: To preserve this great in-state rivalry. While the interests of athletic departments and sponsors come and go, changing over time, the fans of the State of Iowa must maintain a voice in the conversation.